Flashback – Bandung Getting ready for the Asian-African Conference the 60th. Asia Africa echoed from Bandung. On Monday, April 18th, 1955, Bandung Getting ready since the dawn has looked activity in Bandung, for the opening of the conference. From 07.00 am both edges along Jalan Asia Afrika from start next Preanger up with the post office crowded by people who want to welcome and watch the guests from various countries. Meanwhile, the security personnel consisting of soldiers and police have been prepared on the premises of their duty to maintain security. Around 08.30 pm, the delegates from various countries walked out of Hotel Homann and Preanger towards Gedung Merdeka in groups to attend the opening of the Asian-African Conference. Many of them wear the national dress of each diverse hues. They were warmly welcomed by the people who lined up along Jalan Asia Afrika with applause and cheers chirpy. Traveling the delegates from Homann and Preanger was then known as the “Historic Step” (The Bandung Walks). Approximately 09.00 am all the delegates into the Merdeka Building. Not long after the entourage of President and Vice-President of Indonesia, Sukarno and Mohammad Hatta, arrived in front of Gedung Merdeka and welcomed by people with cheers and squeals “independent”. 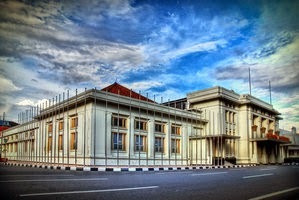 In front of the gate of the second Merdeka Building, Indonesian government leaders were greeted by five prime ministers of state sponsors. At 10:20 pm after the national anthem is played Indonesia: “Indonesia Raya”, the President of Indonesia, Soekarno, the opening speech entitled “Let a New Asia And a New Africa Be Born” (Let Gives Birth to New Asia and New Africa). On the occasion of President Sukarno declared that we, the conference participants, coming from different nations, as well as social and cultural background, religion, political system, even skin color was different, but we can come together, united by the same bitter experience by colonialism, by the same desire in an effort to maintain and strengthen world peace. The speech drew attention and influence the audience as evidenced by the Prime Minister of India and supported by all participants of the conference to send a message of gratitude to the President on his speech. At 10.45 pm., The President of Indonesia, Soekarno, ended his speech, and then the trial reopened. By acclamation, the Prime Minister of Indonesia was elected as the chairman of the conference. In addition, the Chairman of the Joint Secretariat, Ruslan Abdulgani, chosen as the secretary general of the conference. The smooth running conference is made possible by the existence of an informal meeting first among the heads of delegations of the sponsoring countries are participants before the conference began on 17 April 1955. The meeting resulted in several agreements regarding the procedures of the event, the conference leaders, and others who deemed necessary. Some agreement that contains, among others, that the procedure adopted by the conference and as simple as possible and in decisions that will be taken by the system of deliberation and consensus (consensus system). The trial consisted of a conference open to the public hearings were closed only for conference participants. Formed three committees, namely the Political Committee, the Committee on Economic, and Cultural Committee. In subsequent sessions of some of the difficulties that can arise previously thought. The difficulties mainly occurred in the sessions of the Political Committee. Political differences and problems faced by the Asian and African countries come to the surface, even to the extent that relatively hot. However, of the wisdom of the chairperson and the tolerance and kinship among the conference participants, the deadlock is always unavoidable and protracted meetings may be terminated. After going through sessions stressful and tiring for one week, at 19:00 pm. (Late than planned) on 24 April 1955, the General Assembly of Asian-African Conference was opened. In the General Assembly read by the secretary general of the conference formulation of statements of each committee (committee) as a result of the conference. The General Assembly approved all of the statements, then the trial continued with the speech given by the head of the delegation. After that, the chairman of the conference closing speech and declared that the Asian-African Conference closed. Economic cooperation; Cultural cooperation; Human rights and self-determination; Colonized people’s problems; Other issues, the Declaration on promoting world peace and international cooperation. 1. Respect for human rights and respect for the purposes and principles of the UN Charter. 2. Respect for the sovereignty and territorial integrity of all countries. 3. Recognizes the equality of all races and equality of all nations large and small. 4. Do not intervene in the internal affairs of other countries. 5. Respect the right of each nation to defend itself or collectively, in accordance with the UN Charter. 6. (a) No use of arrangements of collective defense for special interests of any major country. (B) Do not put pressure on any other country. 7. Do not commit acts of aggression or threat or use of force against the territorial integrity or political independence of any country. 8. Completing all international disputes by peaceful means, such as through negotiation, conciliation, arbitration or judicial settlement, or other peaceful means of choice the parties concerned in accordance with the UN Charter. 9. Increase the interest and cooperation together. Uphold justice and international obligations.